Take one of the most popular crypto-game ever and make it better - with quick problem-free gameplay, more engagement and tons more fun. That was the goal that the Coin Dogs team put forth for themselves and it seems that they have met these goals. Picking up where CryptoKitties left off Coin Dogs is upping the crypto-gaming by introducing racing, bounty, chat, achievements, awards, and accessories. Because while we may love cats, dogs are after all still man’s best friend. Picture a game where you can earn cryptocurrency while you sleep. Imagine being at work and checking your phone to see new payments in your wallet. In Coin Dogs you breed and race virtual dogs using one of the top 8 cryptocurrencies. You can race your dogs on autopilot day and night against other crypto dogs. When other players breed your dogs, you also collect instant income to your wallet. You are a cryptocurrency entrepreneur. You are a digital tycoon magnate and the money you earn is not make-believe. Breed your dogs for speed. Breed them for profit. You can also buy them accessories and outfits to make them more attractive than other crypto dogs. You aren’t breeding cute Bambi. You are breeding your own virtual Hercules that is 100% unique. You become your own DNA scientist as you explore 6 trillion genetic possibilities to create the most powerful crypto racing dog in the game. 100% unique one that no one else has. Your dog’s performance on the racetrack is influenced by the dog’s DNA, age, experience, mood, and even the real-world phase of the Moon. Racing in the game is free of any fees. Dogs can even race automatically on autopilot without your presence. Pixel Cloud’s income (the company behind Coin Dogs) is limited to breeding fees, sales of new dogs and accessories. They take security very seriously and they won’t pull a ZUCKERBERG on you by profiting from your private information. The chance to breed unique dogs with unique traits provides an element of scarcity, which increases the perceived price of those collectible dogs. Due to the interactive social nature of the game, various breeds will end up desirable by players seeking both financial and social value. Along with breeding, Coin Dogs’ racing aspect is the very first of its kind in cryptocurrency gaming. Users may enter their dogs in races with a Litecoin entry payment, and the winner dogs in each competition collect their winnings. Attributes like DNA, experience, mood, and age affect a dog’s racetrack performance. With a player-to-player game, the social aspect is a major element in players’ entertainment and profitability. The Coin Dogs platform enables people to highlight their best dogs for breeding, social capital, and popularity interest. 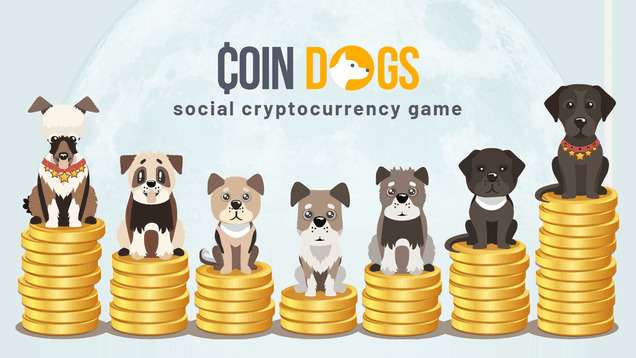 Check out the new cryptocurrency game Coin Dogs.